4mm crystal in each birth month. Wire wrapped in sterling silver. Charm comes with a jump ring. The stamped Checked Tag Charm is an elongated charm which is stamped with up to 10 characters going down vertically. 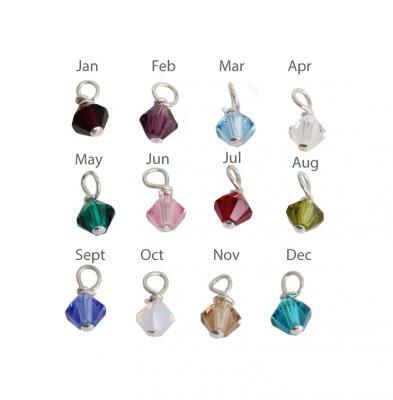 4mm crystal in each birthstone month. Wrapped in sterling silver wire. If you prefer, you can send your original necklace back to us using this form. Please fill out the form completely and include a drawing of exactly how you want your necklace or bracelet to look after the charm is added. There is a $15 charge to returning the necklace or bracelet and having us add the charm and ship it back to you. We will also clean it before returning it to you so it looks as close to new as we can get it!